The numbers are in. The 2015 Gulf of Mexico Hypoxic Zone or Dead Zone measures 6,474 square miles – about the size of Rhode Island and Connecticut combined. This is a huge blow to the already fragile Gulf ecosystem and economy. It begins innocently enough. Farmers use fertilizers to increase the output of their crops so that we can have more food on our tables and more food to sell to the rest of the world. But it is this agricultural run-off combined with urban run-off that brings excessive amounts of nutrients into the Mississippi and starts a chain of events in the Gulf that ends deadly. These nutrients fuel large algal blooms that then sink, decompose, and deplete the water of oxygen. This is Hypoxia – when oxygen in the water is so low it can no longer sustain marine life in bottom or near bottom waters – literally a dead zone. When the water reaches this hypoxic state, fish and shrimp leave the area and anything that can't escape like crabs, snails, and starfish die. So, the very fertilizers that are helping our crops are disrupting the food chain and devastating our food sources in the ocean. With an increase in size of over 25% from last year, the dead zone is still much larger than the target of 1,900 square miles set by the Mississippi River/Gulf of Mexico Watershed Nutrient Task Force, an interagency group with a mission to reduce Gulf hypoxia. 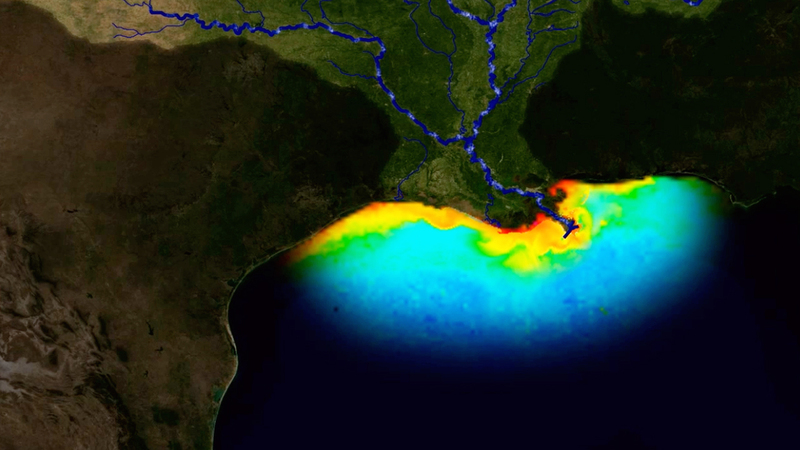 If the amount of fertilizer and sewage dumping into the Gulf isn't reduced, the dead zone will continue to wreak havoc on the ecosystem and threaten some of the most productive fisheries in the world. Less oxygen dissolved in the water is often referred to as a “dead zone” because most marine life either dies, or, if they are mobile such as fish, leave the area. Habitats that would normally be teeming with life become biological deserts. The second largest dead zone in the world is located in the U.S., in the northern Gulf of Mexico.